A painting featuring President Barack Obama in a Christ-like pose is getting poor reviews from some religious authorities, Fox News Radio reports. 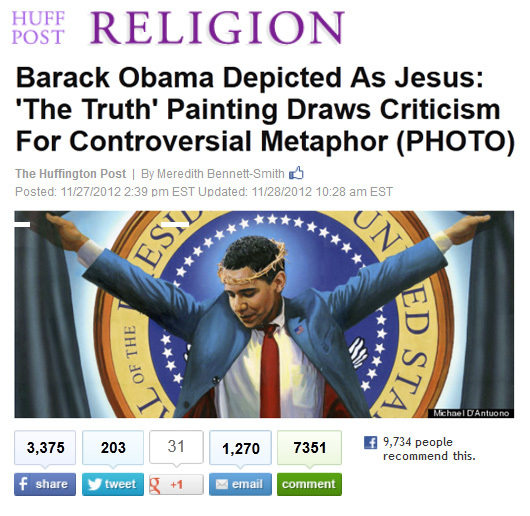 The painting by New York-based artist by Michael D’Antuono is titled “The Truth” and features Obama with a crown of thorns on his head, in a position that is reminiscent of the crucifixion. Currently on display at Boston’s Bunker Hill Community College Art Gallery as part of D’Antuono’s politically charged “Artists on the Stump – the Road to the White House 2012″ collection, the piece was actually supposed to debut several years ago at New York City’s Union Square. D’Antuono said he received 4,000 emails “mostly from the irate Christian Right who misinterpreted the art as blasphemy” and canceled the event, a decision he now regrets.